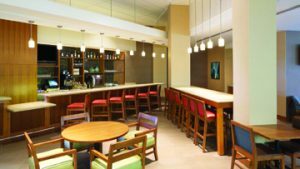 Full Bar: The nine-seat bar at the Hyatt Place/ Denver Cherry Creek features Starbucks coffee and a full bar that is open to the public. 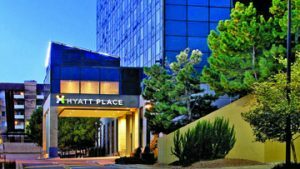 The Hyatt Place Denver/Cherry Creek in the heart of Glendale just celebrated its fifth anniversary. But, the hotel has stood on this property since 1986. In fact, it was the site of the first office of the Glendale Chamber in 1999, when Jerry Peters, now City Manager, helped launch the Chamber. “We had the broom closet on the top floor and I would meet people downstairs who were interested in joining the Chamber,” said Peters. Back then, it was the Loews Giorgio Hotel but now, it is a 12 floor, 199 room Hyatt Place. “We have a full size and service restaurant kitchen,” said Heath Dobyns, General Manager of the Hyatt Place Denver/Cherry Creek. “We are really trying to utilize that with the bar.” The restaurant is open 24 hours and available to the public, not just guests of the hotel. Breakfast is served fresh every day with cage-free eggs, steel-cut oatmeal, whole fruit, all-natural bacon and sausage, and more. Dinner is also available to the public in addition to guests. 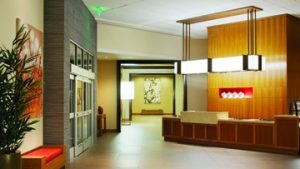 Originally built as a full-service hotel, it is a unique Hyatt Place that offers full meals with menu items that include grass fed beef and it can also offer its guests and the general public a nine-seat bar with a bartender. Own Stamp: The lobby of the hotel has changed since it was the Loews Giorgio but over the last five years, the Hyatt Place Denver/Cherry Creek has made its own mark in the area. Hallowed Ground: The Hyatt Place Denver/Cherry Creek is located at 4150 East Mississippi Avenue. The hotel, which was formerly a Loews Giorgio, was home to the Glendale Chamber when it launched in 1999. An interesting note is that the Hyatt Place has a lifetime contract to lease the space at the top of the office building next door which is being sold. The building is affectionately known as the Darth Vader” building by locals. The contract survives all sales of the building and is leased for only $250 per month. If Chronicle readers mention this article, they can stop in for a free cup of Starbucks coffee or cocktail from the bar. 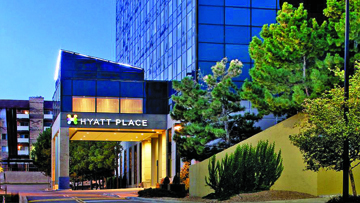 The Hyatt Place is located at 4150 East Mississippi Avenue in Glendale. Visit www.hyatt.com for more information. Guest Rooms: There are 199 guest rooms in the 12-story hotel. All of the spacious guest rooms feature plush Hyatt Grand Bed® and state-of-the-art media and work centers.